3/15 – finished body, this time added face before finishing. Trying the knit cast-on! Going with a size bigger than the pattern in the hope of getting a more “open” feel. 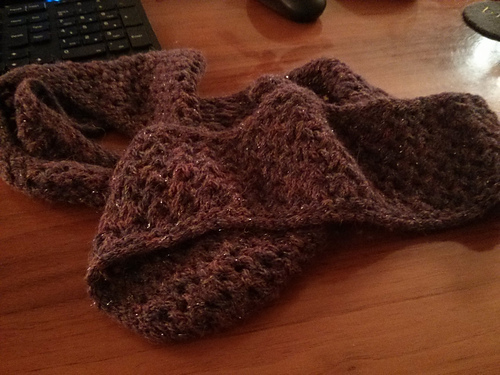 1/8 – doing a single row of purl instead of the 3 rows garter between the YO/K2tog in the pattern. I think it’s turning out that I’m knitting it inside-out, essentially. 1/9 – I’m pretty sure that I twisted the join. :\ Since it’s a cowl, I think it’ll be ok.